Adura MaxAPEX Vinyl Flooring is available from Schillings.com! This collection from Mannington has a huge selection of today’s most popular styles and colors. It also has some of the most advanced features in the industry, such as the HydroLoc waterproof core. This product line is the perfect choice for any room in your house. Adura MaxAPEX Vinyl Flooring is available in 4″, 6”, 8″ x 48”, 6″ x 36″, or 8″ x 72″ planks. Each plank easily locks together for easy installation. The vinyl planks can be quickly installed on all grade levels and can even cover your previous floors and subfloor. For more information on Adura MaxAPEX Flooring and Adura MaxAPEX pricing, please call or chat. These products are backed with a stress-free limited, lifetime residential and 10-year light commercial warranty against wear through, staining, fading, delamination and joint separation. 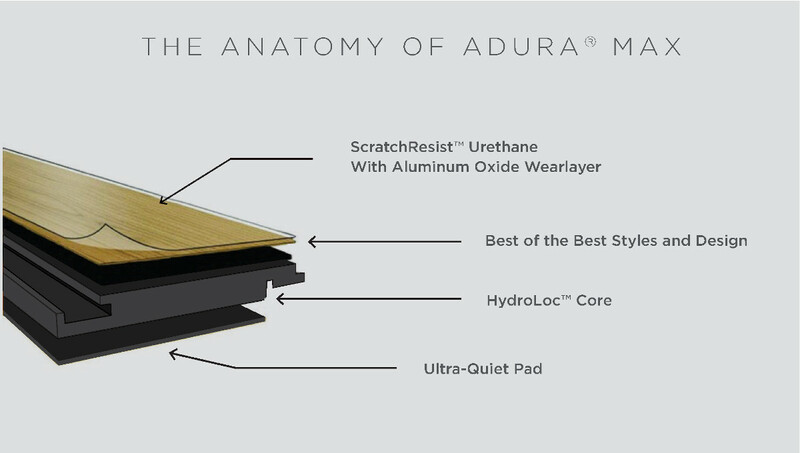 Adura MaxApex includes our premium, Ultra-Quiet pad for greater sound reduction and superior comfort. This feature is great for noisy and high traffic areas. The Ultra-Quiet pad also makes Adura MaxAPEX a quieter, more durable, and more comfortable option than traditional hardwood. The HydroLoc waterproof Core makes Adura MaxApex 100% waterproof. In addition to making this luxury vinyl waterproof, the HydroLoc core also increases the stability of this product by preventing Adura MaxAPEX from cracking or collapsing under heavy pressure. Because the core is 100% waterproof, it is a great option for installation in high moisture areas where hardwood would not normally be recommended, such as bathrooms and kitchens. One of the key features of the Adura MaxApex is ScratchResist with aluminum oxide. This technology allows Adura MaxAPEX to stand up to the most active households while offering the industry’s best wear, scratch and stain resistance. The ScratchResist coupled with the warranty will give you peace of mind knowing you have a product that will last. You will find that your room will have a new beautiful, durable, quiet and comfortable floor that everyone will enjoy. You will not want any other flooring in your house! You can protect your Mannington Adura® MaxAPEX Floor by following these easy guidelines. Use doormats outside each entrance to your home to prevent dirt, sand, grit and other substances; such as oil, asphalt and driveway sealer; from being tracked onto your floor. Use non-staining mats on your floor. Do not put rubber-backed, latex-backed or coco fiber mats on your floor because they will stain or damage the surface. In order to minimize potential staining from asphalt tracking, we suggest you use a latex-based driveway sealer on your driveway. Close your curtains or blinds where extreme sunlight hits the floor. Sunlight, in addition to heat, causes most home furnishings to fade or discolor. Support furniture with wide-bearing, non-staining floor protectors. Ideally, the protectors should be at least one inch in diameter, made of non-pigmented hard plastic, and rest flat on the floor. Also, non-staining felt protectors are also acceptable. Casters with a minimum 3/4″ flat surface width or floor protectors are recommended for all moveable furniture. Make sure any metal protectors are rust-proof. Replace your narrow dome furniture rests with wide-bearing ones. If you need to move heavy furniture and/or appliances across the floor, always use strips of wood or hardboard runways to protect the floor. Always use runways even if you have an appliance dolly, or even if the heavy objects are equipped with wheels or rollers. Adura® MaxAPEX floors are low-gloss floors; use polish or “mop and shine” products only if you wish to make the floor shiny. After several applications of polish for a high-shine floor, an occasional stripping and reapplication of polish may be necessary. We recommend the use of Mannington Award Series® Heavy Duty Cleaner and Stripper. 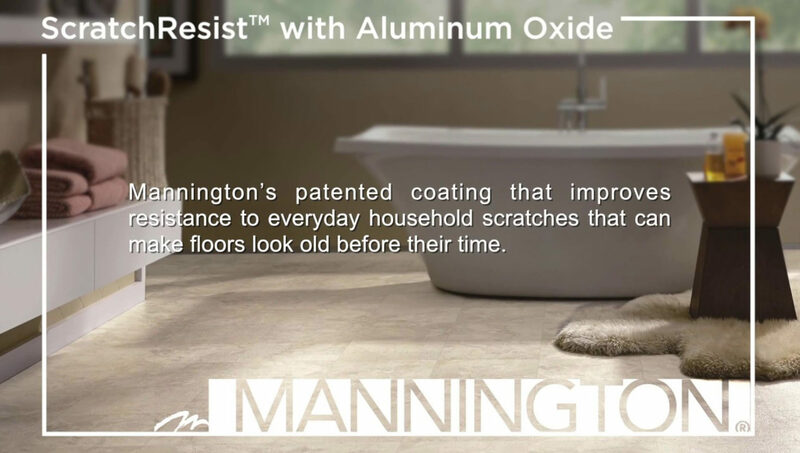 After a thorough cleaning, rinsing and drying, apply Mannington Award Series® High-Gloss Polish to restore the shine. Do not use wax and do not buff. High-traffic areas may require more than one application of polish. Allow polish to dry “tack-free” between coats. The overall stain resistance of our Mannington Adura® MaxAPEX floors is excellent and most spills will wipe off quickly and easily with a clean, white cloth. Removing certain substances may take a little extra effort, as outlined in the chart below. Start with the first step listed. Rinse with clean water and allow the area to dry between steps. Food, Beverages If a substance is gummy, scrape off with a dull knife. Clean using Mannington Award Series® Heavy Duty Cleaner and Stripper and a soft nylon pad or soft bristle brush. Saturate a clean, white cloth with bleach solution, cover stain and allow to stand for no more than 1 hour. Lipstick, Antiseptics Scrape excess off with a dull knife. Clean using Mannington Award Series® Heavy Duty Cleaner and Stripper and a soft nylon pad or soft bristle brush. Wipe with a clean, white cloth dampened with lighter fluid, painter’s naphtha or isopropyl alcohol. Saturate a clean, white cloth with bleach* solution, cover stain and allow to stand for no more than 1 hour. Mineral spirits, lighter fluid, painter’s naphtha, and isopropyl alcohol are flammable liquids. Please follow precautions listed on the container.